Asking someone to marry you is one of the most crucial decisions of your life. Deciding on the engagement ring is almost as tricky as deciding on your life partner with whom you want to spend the rest of your life together. We have always seen a guy/girl asks the other person to marry them. You must have wondered that since when we’ve been doing this or for how long this has been a tradition? Like other traditions, this one has a history and symbolism behind the ritual of exchanging rings before the marriage. Different part of the world has different traditions of proposing someone for a marriage.Some people believe that about 4800 years ago, people from ancient Egypt started this ring tradition. The ideology behind wearing the rings is that the circular shape of the ring is a symbol of eternity, with no beginning or end. It signifies something that goes on forever and knows no boundary, just like your love for that person. Not only in the Egypt history, was it believed to be out there in other cultures as well. The hole in the center of the ring also has other significance attached to it. It was not considered just like space, but rather has similarities with a door or gateway. A door leading to events and things despite being known or unknown. Offering a ring to your other half exemplifies your never-ending and immortal love for them. A promise for life. Being there for each other in their sickness or in their health, through thick or thin and willingly endeavoring the roller coaster quest that life is. In every relationship, engagement is just the first step. You want to impress the love of your life with everything you’ve got. One needs to come up with tons of gimmicks just to make the other person feel more special and loved. You may have fallen for a certain someone, but falling for a particular engagement ring can take you a while. The process of buying an engagement ring could be indeed draining the time and energy.As long as you are in love and make each other happy, the engagement ring you choose doesn’t matter. Furthermore, do you know, that your engagement ring has a lot to do with your personality, your preferences and your choices in your life. Find out what your engagement ring says about you! 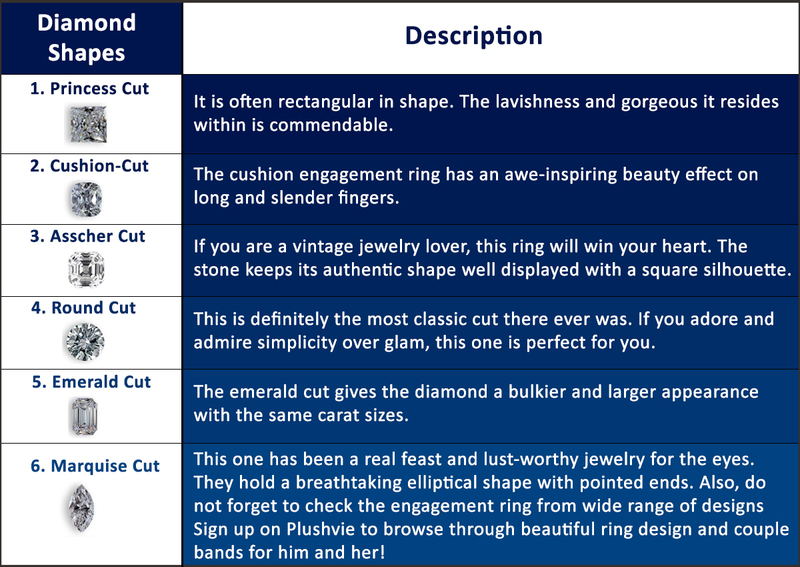 Opting for either a proposal ring or couple bands, you can pick from a number of options you get. Let’s have a quick look on these kinds.